Here is an analysis on the strengths and weaknesses of Royal Challengers Bangalore this year. AB de Villiers - De Viliers is the best batsman in the IPL (projected batting impact +3.28). He can - and most likely will - win matches single-handedly. Until he is out no total is safe. Star-studded batting - De Villiers will be joined in a powerhouse top order by Kohli (projected batting impact +1.42) and one of Klaasen (+0.65) or Hetmyer (+0.55). At the batting haven the M. Chinnaswamy Stadium these players could wreak havoc. Spin bowling - Chahal (projected bowling impact +2.25), Washington (+0.73) and Negi (+0.23) has the potential to be a strong spin trio. Chahal has been a consistent performer in the IPL for many years now. RCB need Washington to replicate his brilliant debut season, not his first season for RCB where his struggles robbed the team of a controlling finger spinner and a potential all rounder. Indian batting depth - RCB lack Indian batting depth. Other than Kohli and Parthiv Patel - who will likely play a key role as opener - no Indian member of their squad has more than 1500 T20 runs. The third highest Indian run-scorer is Gurkeerat Singh. RCB will be heavily reliant - yet again - on Kohli and overseas batsmen if they are to post competitive totals. Bowling depth - Chahal (+2.25), Washington (+0.73), Negi (+0.23) and Umesh (+0.16) are RCB’s only positive impact bowlers. Together this could form the basis of a strong bowling core but they will need support from Coulter-Nile (-0.03), Southee (-0.34), Siraj (-0.77) and the all rounders. This is not impossible; they are all international bowlers, but they are not reliable performers at this level and will need to step up. Death bowling - Death bowling was one of RCB’s major problems last season - their economy rate in the last five overs of the innings of 11.86 was by far the worst in the competition. This season they will be strengthened by Coulter-Nile who missed last with injury but Umesh, Southee and Siraj are inconsistent defensive bowlers and they may struggle to contain runs towards the end of the innings once again. 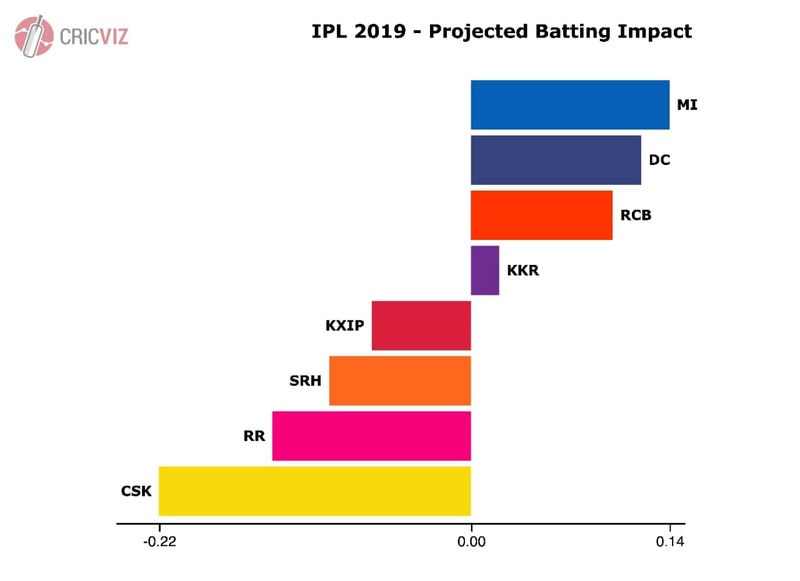 All rounder bowling - RCB’s bowling issues are compounded by the fact that Moeen (projected bowling impact -0.90), Stoinis (-1.82) and de Grandhomme (-2.70) are the weakest three bowlers in RCB’s squad. They are are almost certain to play one of them but relying on their bowling will cause problems.